Arsenal eliminated Rennes from the UEFA Europa League in the round of 16 last night and they will be hoping to get a favourable opponent in the quarter finals. 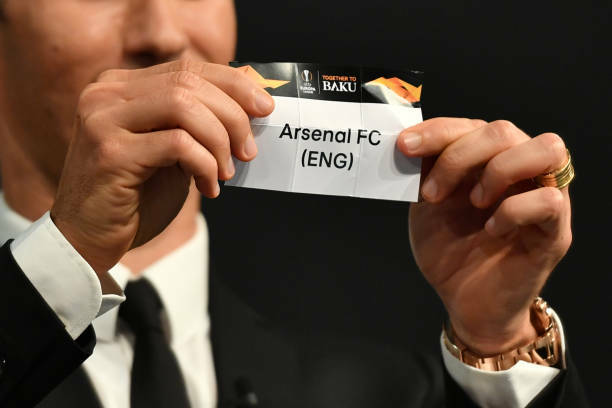 Arsenal has qualified to the UEFA Europa League quarter finals for the second time in a row and they will be hoping to get a favourable draw as we approach the difficult stages of the competition. Arsenal defeated Rennes 4-3 on aggregate to qualify to the next round of the competition and Unai Emery will be hoping to win it for the fourth time in his career. SO WHEN IS THE UEFA EUROPA LEAGUE QUARTER FINALS DRAW? The UEFA Europa League round of 16 matches are done and the quarter finals draw will be done today at 12:00PM UK time. CAN ARSENAL GET DRAWED WITH CHELSEA? Yes, UEFA rules say that there isn’t country protection at this stage of the Europa League so there is a possibility that the gunners might get drawn with their London rivals Chelsea. It would be interesting if Arsenal gets drawed with Chelsea in the quarter finals. ARSENAL’S POSSIBLE QUARTER FINALS OPPONENTS? So those are the teams that the gunners could possibly face in the UEFA Europa League quarter finals but Arsenal fans will probably be hoping that they don’t get drawn with Napoli and Chelsea at this stage of the competition. The gooners would be extremely happy to get drawn with Villarreal because they would finally give Santi Cazorla the perfect goodbye that he deserves.